grrrrrr. Trying to keep up with the details prior to departing for the United Kingdom. 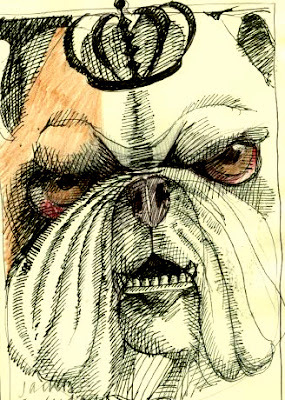 Am thinking about bulldogs, Queen Victoria and Virginia Woolfe. So, you will see sketches in the next few days. Sorry for my silence. I am multitasking and the blog falls out of the mix. More later. The more is that the Tburg Pourhouse belated celebrated their first anniversary tonight to great singing and playing of all the local, terrific talent. We were treated to the air raid siren, ducet crooning of Jim Reidy with the pick up version of the Chicken Chokers with funny Chad Crum wearing a wild fur hat that looked like an Andy Warhol extension of what normally grows atop his skull...with great fiddling and howling along with the music. Bill Chaisson was the impressario of the evening, wearing a spangly top hat (a la New Years eve) stuffed with raffle tickets poking out of the bottom. His deep voice faded and boomed with his wonderful ability to put words (particularly big and important words) together in a very terse and descriptive way. It was fun with all the best hits of the locals coming in to wish Liz and her team the best of luck in the coming year. Here's to the Pourhouse! One Year Old! !